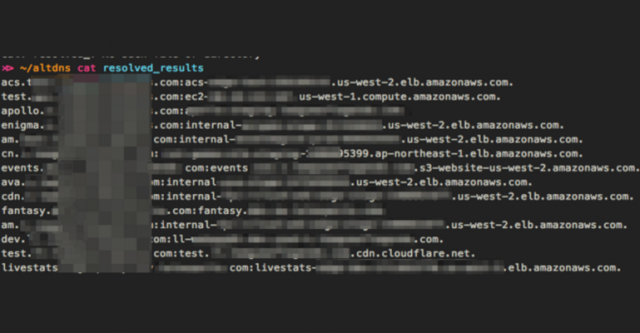 Altdns is a Subdomain Recon Tool in Python that allows for the discovery of subdomains that conform to patterns. The tool takes in words that could be present in subdomains under a domain (such as test, dev, staging) as well as takes in a list of subdomains that you know of. Alternatively, the -r flag can be passed to altdns so that once this output is generated, the tool can then resolve these subdomains (multi-threaded) and save the results to a file. Altdns works best with large datasets. Having an initial dataset of 200 or more subdomains should churn out some valid subdomains via the alterations generated. the -s command tells altdns where to save the results of the resolved permuted subdomains. results_output.txt will contain the final list of permuted subdomains found that are valid and have a DNS record.